Published: Aug 4, 2012 to ? Adaptation: Kono Oto Tomare! 2nd Season, Kono Oto Tomare! 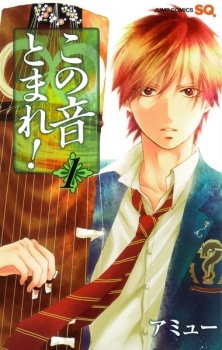 Firstly I want to thank user inzaratha for recommending "Kono Oto Tomare!" to those who are reading "Chihayafuru!". If not her, I might have missed this gem. The story in this manga is great. Its premise is unoriginal, but the way it's being told and the pacing makes it highly enjoyable to read. It has some funny moments, some touching moments, and some sad and romantic moments. I've read 17 chapters at the moment and there wasn't a single one that didn't serve purpose or was boring in any way. I give the story a 9. One of the main strengths of "Kono Oto Tomare!" is the art. If not for the art, many moments wouldn't have the same emotional impact. It's really hard to describe it with words, it's better to see it for yourselves. I give art a 10. I really love characters in "Kono Oto Tomare!". They are very likable and interesting. Kudou Chika - a bully and an outcast with a tragic past. Everyone fears him, but he is strong, honest, determined and really cares for his friends. Kurata Takezou aka Four Eyes - Koto club president and the only member of the club at the beginning of the story. He is good and diligent person, but he lacks confidence. Hozuki Satowa - One of the most beautiful girls I have seen in manga or anime. The young prodigy of the koto world. Because of her talent she is very lonely and don't have any friends. The whole cast has a great chemistry but the chemistry between Chika and Satowa is something else. First time since "Dengeki Daisy" that I've enjoyed the interactions between two leads this much. I'm having a great time with this manga, I've read all 17 chapters in a single breath. Overall I highly recommend this manga to people who like interesting personal stories with great characters and art. The only flaw "Kono Oto Tomare!" has that it's only 17 chapters long at the moment, and you'll be craving for more. And as of final score - manga that had me on the verge of tears several times can't get anything less than 10 from me. I'm surprised to see that there's not a single review for this manga, yet. Well, this will probably more of an opinion than a review, so I'm going to make it plain and simple. The plot/story is very simple (8). A delinquent guy who actually has a soft heart especially for his friends and family, who joined a club in honour of the grandfather whom he adores so much. This is more of a music genre. I was reluctant to read this at first because I don't exactly know what a Koto is, how it sounds like (it probably sound like a guitar or something), etc. But the Art (which I rated 8) is kind of enticing so I gave it a try. The characters (8) are those you always see in a manga. But they do have good individual points that make the manga really interesting. Enjoyment (9). There is so much this manga could offer. Too many feels. And not to mention that it's really hard to make a manga that requires music. Like I said, this is more of a music genre. I never read these kinds of manga. I watched Nodame Cantabile for the same reason. I'd rather really hear the music than just read it. Because, imagine reading a song lyrics that you don't know how it sounds like. of course, that won't give too much impact on a reader, right? But, this manga seem to have pulled it off. it might be the art. Or the sfx thingy, or the characters' expressions whenever they play the damn Koto. It could be anything. But the manga still pulled it off. I didn't know what a Koto sounds like. but I did get goosebumps during that performance in front of all the students. it was totally amazing. You get dragged in inside the manga and be one of the audience. It's a different experience for a reader like me. Kono Oto Tomare! The strawberry cheesecake for my soul, the pudding of dreams for my ears...this Sound That Makes You Stop is hands down one of my manga favorites of all time. It's relaxing, hopeful and encouraging and a total feast to read. The synopsis of the story doesn't give away much and the reason I first got interested was the fact that the series seemed to revolve around koto playing. I'm a big fan of Wagakki Band and especially their koto player Kiyoshi so I was curious to see what kind of story could be made out of playing an old traditional instrument. Is this solely a story about music? It definitely is the main feature, the driving force to act and the means to do so, but it's also much more. This is a character-driven and character-centered story with the music on display all the time flavoring everything like a good icing on the cake. The story itself is rather mediocre slice-of-life school club case but what sets it apart is the way it's executed. The story is crafted brilliantly to show everything just in the right time and just for the right amount, leaving the reader satisfied but still craving for more. If you're weak against underdog stories about the outsiders, the misunderstood and the mistreated and redeeming oneself...well, here you go. The characters are the one thing that may make it or break it. Can you connect with them and care about them? There's a bunch of multi-dimensional characters you get to know, hate and then maybe love and their strength lies in that they all get room to breathe, grow and improve. It's been a delight to see different kind of relationships building up and the character interactions are always well-made and on spot. The drama is never over-exaggerated but rather calm and balanced and never leaves you with negative feelings, even when it makes you cry. The. Art. Is. To. Die. For. The style is rather realistic with clear and beautiful lines which complete the story perfectly. The characters are unique and someone might even say they're all too pretty! I want to especially mention the koto performance parts which are made skillfully to represent the feelings conveyed via playing. Can you enjoy this even if you don't know koto music? I believe so. Deep down the story is about winning hardships and believing in yourself and the others around you. There's friendships, rivalries, slow burning romances and from time to time a feeling you get from reading a sports manga that makes you wanna scream: "Go Tokise High!" Kono Oto Tomare! is a brilliantly crafted story about how the music affects peoples' lives and how it can help them to grow. Recommended for people who become easily attached to characters and want to see character development above everything else. On the side note, if you wanna hear the music played in the series, there's an official CD release which has real-life koto players performing the pieces! Like many people stumbling upon Kono Oto Tomare!, I found this from the Chihayafuru page. And I've got to say I'm not disappointed. What I notice first about manga is the art. And I am absolutely in love with Amyuu Sakura's art. It's cute, clean, and extremely detailed. I like how it isn't too flashy like Arina Tanemura's works (she's the mangaka of Full Moon Wo Sagashite). The characters look realistic yet still have that manga vibe to them. And--brownie points!--the guys look like guys and girls look like girls. So the art is really a ten out of ten for me. But art is just one component. I really like the story and characters as well. The story is pretty simple, and I can pretty much predict what would happen from this point. But what can I say, I'm a sucker for work-hard-for-common-goal-with-team-usually-in-competition stories. What really has me hooked are the characters. Specifically, the character dynamics. I especially love how their interactions are pretty normal (as in real people act like that), yet there are some typical shoujo moments. It's great, because while realistic character interactions are great and all, I still like those sa-wooon moments you get from reading shoujo. Don't get me wrong, this is definitely a shounen manga. Yet I can see some itty bitty romance down the road, and it would be interesting to see how this plays out. Something I never got to see in other mangas *cough* princeoftennis. I'm really excited for this manga and am constantly checking for updates. I see so much potential for Kono Oto Tomare! and definitely recommend it to anyone who even remotely likes work-hard-for-goal mangas.